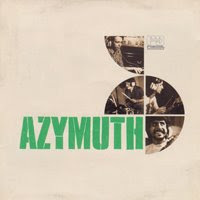 Azymuth is a three-piece electric funk jazz group from Rio de Janeiro in Brazil. Formed in 1972, the members are Jose Roberto Bertrami (keyboards), Alex Malheiros (bass, guitars), and Ivan Conti (drums, percussion). They call their music "Samba Doido", which means "Crazy Samba".From 1979-1989, they released many albums for Milestone Records. They have been releasing albums for various labels steadily since. They had a major hit with "Jazz Carnival" in 1980. Since the early 1990s, they have released albums on the London based Far Out Recordings label, whilst remaining based in Brazil, and continue to tour in Europe.Azymuth have also been involved in producing albums and their artists have been involved in several other projects through the years. One notable album is from Brazilian singer/songwriter Ana Mazzotti, another one for example is Sabrina Malheiro's album from 2005 (daughter to Alex Malheiros).